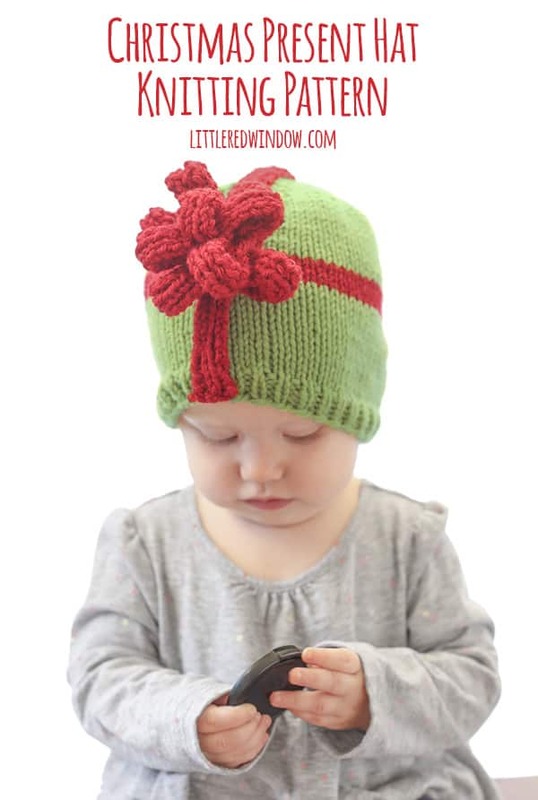 Wrap your sweet little one up like a gorgeous gift with this adorable Christmas Present Bow Hat Knitting Pattern! Obviously now, in retrospect, I realize that’s a little silly. And now when my kids are being sweet and adorable I can fully appreciate what wonderful gifts they are. 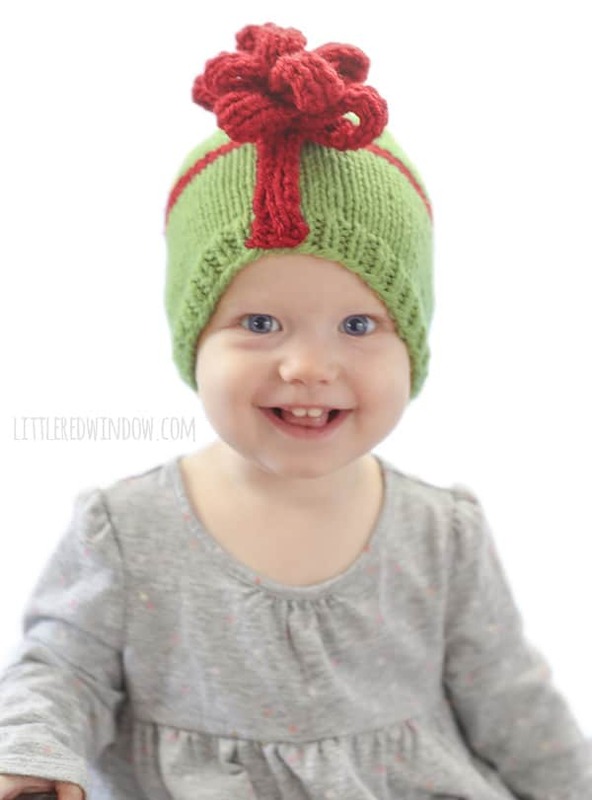 So I thought, what would be cuter than an adorable gift wrapped Christmas Present Hat?! Bonus points if your little one was actually born near the holidays. You could definitely change the colors and make this hat for any other time of year too! I co think there’s not much cuter than Baby V with this giant bow on her head. Here in Chicago, baby bows aren’t really a big deal, but we have a lot of family in the South and I know y’all LOVE big fluffy bows on babies! So I went all out with this one and I totally love it. 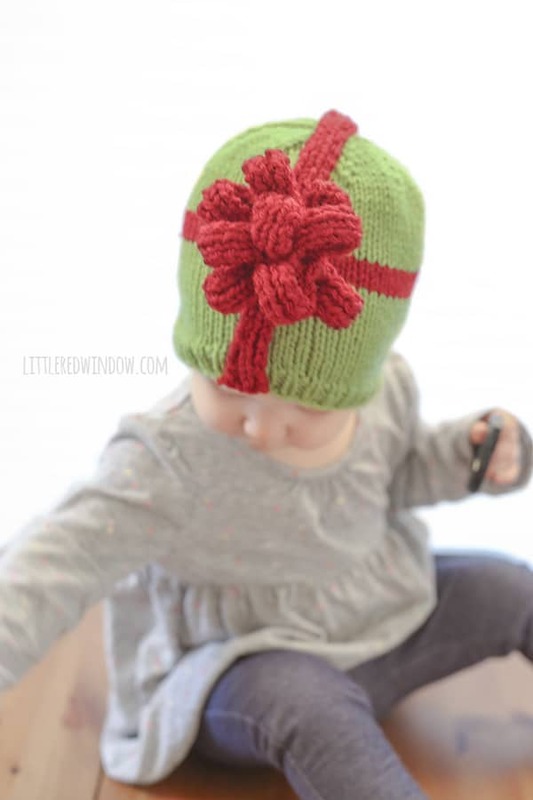 Scroll all the way down for the free version of the Christmas Present Bow Hat knitting pattern! Enjoy! Using long-tail cast on, cast on 64 stitches onto your circular needles with the green yarn color. Join to knit in the round and k1, p1 in a rib stitch for 5 rounds. Knit all rounds for 15 rounds, switch to red yarn and knit all for 4 rounds, then switch back to green and knit all until the hat is about 4 1/2 inches long. First make the long “ribbon” that goes vertically around the hat to make it look like a wrapped gift. 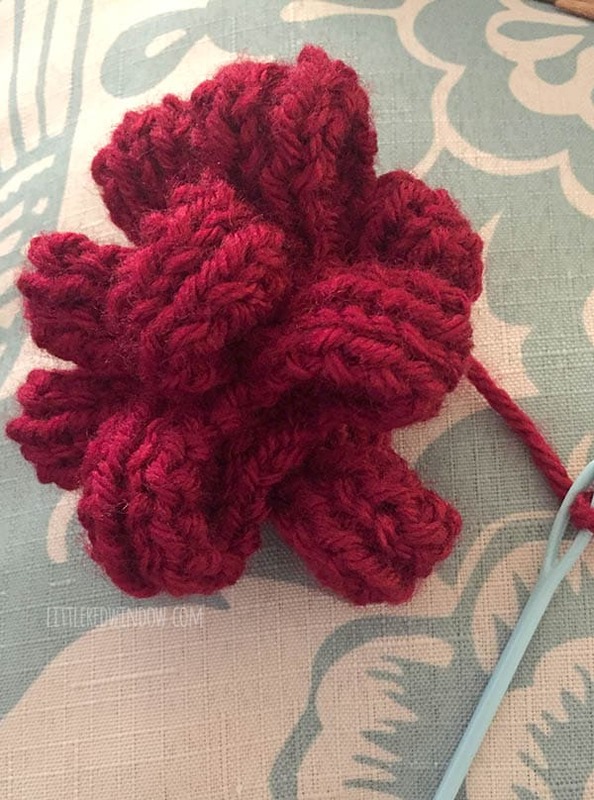 Using double pointed needles as straight needles, cast on 5 stitches with red yarn. Repeat rows 1 & 2 until the ribbon is long enough to go from the center front of the hat, up across the top and back down to the center back of the hat. Then bind off and weave in that end. 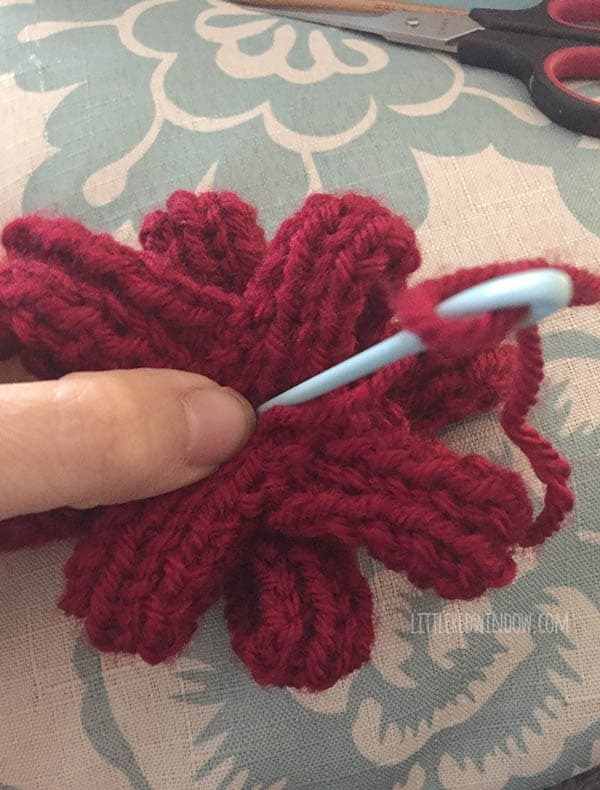 Thread your yarn needle with a long length of red yarn and stitch the ribbon to the hat from the front center brim over the top and down to the back center brim. The bow is made up of several shorter pieces of knitted “ribbon”. 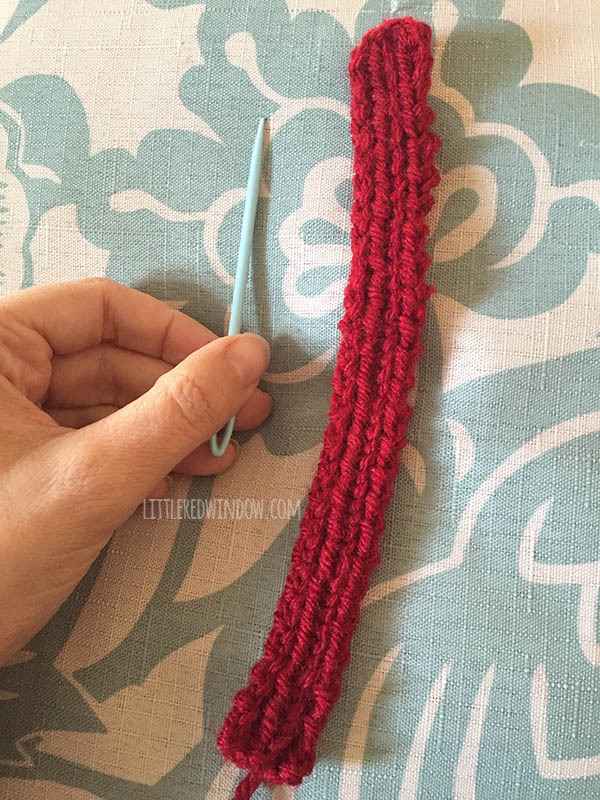 Make each length of ribbon following the same knitting stitch pattern for the long ribbon above, but in the different lengths as listed below. Fold Ribbon A into a loop and sew the ends together. 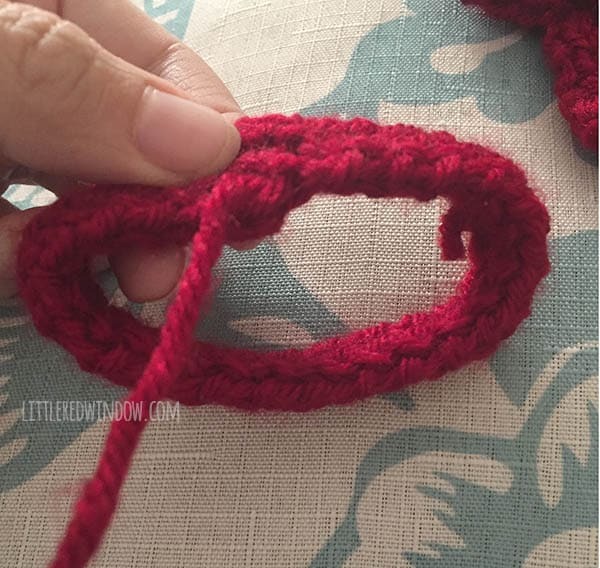 Flatten the loop with the seam on the bottom and make a stitch in the center to hold it in place. Take one Ribbon B and fold it in half. 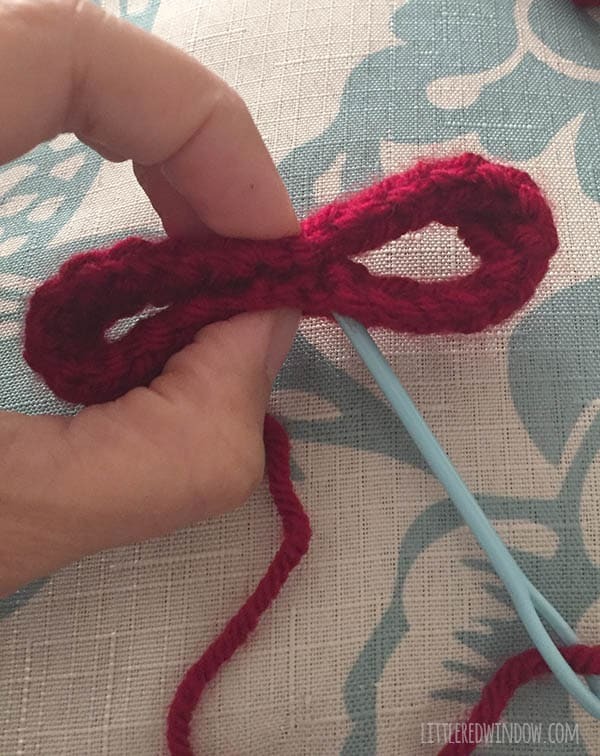 Sew the ends perpendicularly to the middle of the folded Ribbon A loop to form a ‘T’ shape. Repeat with the other Ribbon B opposite the first to form a ‘+’ shape. Repeat and make another slightly smaller plus shape with Ribbon C & both Ribbon D’s. Layer the second slightly smaller ‘+’ shape on top of the first but turn it 45 degrees so together they look like star. Sew them together through the center. 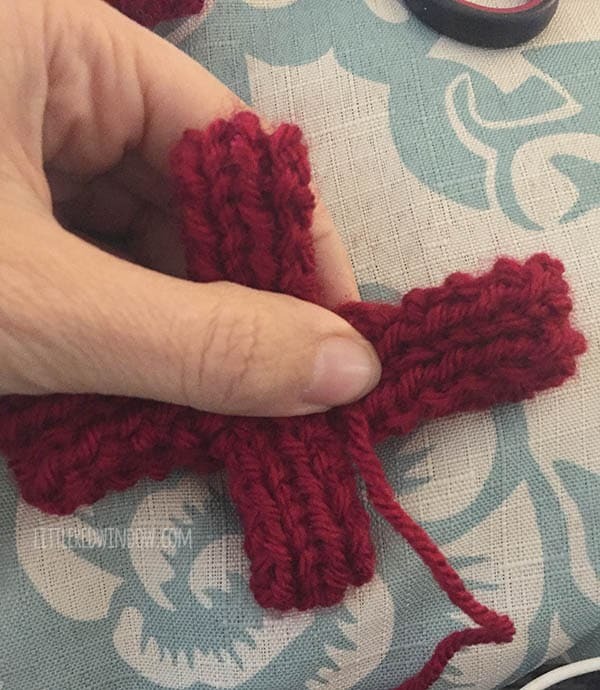 Take Ribbon E, fold it into a loop and sew into the middle of the bow. Fluff the bow. 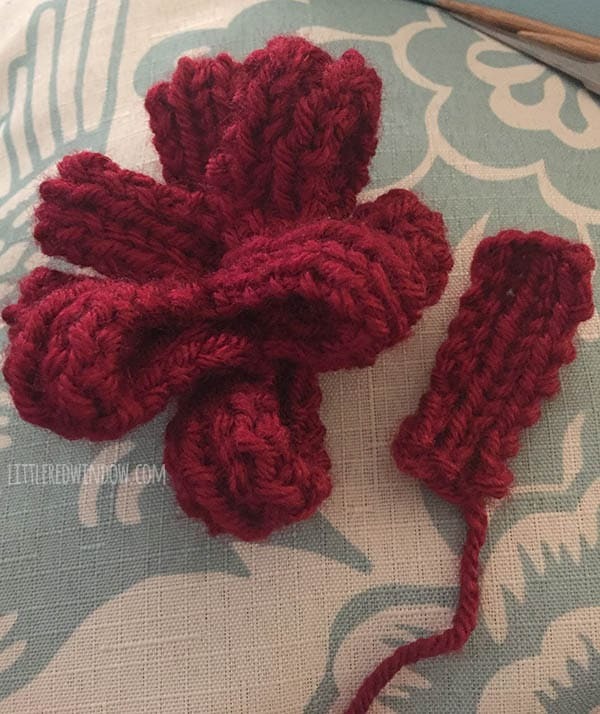 Then thread your yarn needle with a length of red yarn and sew the bow securely to the front of the hat where the two long ribbons intersect. That’s it, your adorable Christmas present is all wrapped! Enjoy your cute Christmas present bow hat!